Winding Hole above Dicks Lane Lock is a minor waterways place minor waterways place place on the waterways major waterways place village town city on the Stratford Canal (South Section) between Lapworth Junction South (4¼ furlongs and 3 locks to the north) and Yarningale Aqueduct (2 miles and 5 furlongs and 9 locks to the south). It is part of Lapworth Locks (lower). 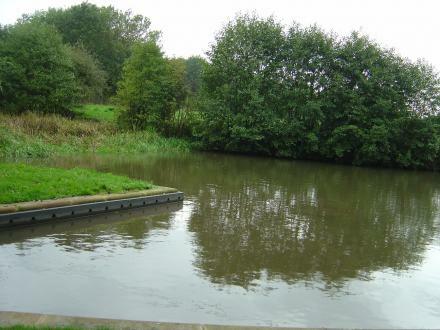 The nearest place in the direction of Lapworth Junction South is Lapworth Lock No 24; 2 furlongs away. The nearest place in the direction of Yarningale Aqueduct is Dicks Lane Lock No 25; ¼ furlongs away. Hampton — 1257 yards to the southeast. Station Lane, Solihull, B94 — 1440 yards to the north. Rowington Green, Rowington, CV35 7DB — 1465 yards to the east. Old Warwick Rd, Lapworth, Warwickshire, B94 6LA — 1248 yards to the north. 22 Yew Tree Close, Solihull, B94 6NB — 1239 yards to the north. Arden House Station LaNE, Solihull, B94 6LT — 1337 yards to the north. 2 Old Warwick Rd, B94 6HH — 1130 yards to the north. The Hub, Warwick, CV36 4DQ — 1484 yards to the east. Finwood road, Rowington, CV357DH — 848 yards to the east. Lapworth — 1190 yards to the north. Lapworth Village Hall, Old Warwick Road, Lapworth, B94 6LD — 1170 yards to the north. Lapworth — 1204 yards to the west. Brome Hall Lane, Solihull, B94 5RB — 960 yards to the north. Bushwood Hall, Lowsonford, Warwickshire, B95 5HA — 1480 yards to the southwest. Lyons Farm, Rowington, Warwickshire, CV35 7DB — 1564 yards to the east. Kingswood Farm, Old Warwick Road, Lapworth,, Warwick, B94 6LX — 1055 yards to the northeast. Old Warwick Rd, Solihull, B94 6LH — 1191 yards to the north. Station Lane, Lapworth, B94 6LT — 1297 yards to the north. Kingswood — 1026 yards to the northeast. Weston Hall Barn Old Warwick Rd, Warwick, CV35 7BT — 997 yards to the northeast. Stourbridge — 869 yards to the north. Warwick, CV35 7 — 907 yards to the east. 5 Finwood road, Rowington, CV35 7DH — 915 yards to the east. Old Warwick Road, Solihull, B94 6LX — 1526 yards to the northwest. Solihull — 751 yards to the northwest. 2 St Chads Cottage, Lapworth, B946LH — 1131 yards to the north. Old Warwick Rd, Solihull, B94 6LU — 1170 yards to the north. Lapworth, Warwick — 1526 yards to the northwest. 189 Station Lane, Lapworth, B94 6JG — 1440 yards to the north. Rowington Green, Warwick, CV35 7DB — 1585 yards to the east. 1146 yards to the north. The Mill, Brome Hall Lane, Solihull, B94 5RB — 1055 yards to the north. 33 Yew Tree Close, B94 6NB — 1241 yards to the north. Brome Hall Lane, Warwick, B94 5RB — 1059 yards to the north. Solihull — 1222 yards to the north. Station Lane, Solihull, B94 6LS — 1469 yards to the north. Solihull — 1045 yards to the north. Foreman’s Cottage, Brome Hall Lane, Lapworth, Solihull, B94 5RB — 943 yards to the north. 2, Old Warwick Road, Lapworth, B94 6LU — 1176 yards to the north. Solihull — 1526 yards to the northwest. Rowington Green, Rowington, CV35 7DB — 1429 yards to the east. Warwick — 1106 yards to the east. Old Warwick Road, Lapworth, B94 6LT — 1526 yards to the northwest. Old Warwick Rd, Lapworth, B94 6LD — 1155 yards to the north. 1484 yards to the east. 843 yards to the east.